A hobby archaeologist with a metal detector has discovered a trove of gold and silver in a German forest dating back to late Roman times, fuelling speculation that it could be the legendary Nibelung treasure which inspired composer Richard Wagner’s operatic “Ring Cycle”. The haul from the western state of Rhineland Palatinate, which is worth about €1m, includes silver bowls, brooches and other jewellery from ceremonial robes, as well as small statues that would have adorned a grand chair, archaeologists say. I very rarely attend open metal detecting events. I’ve been to a few in the past and found virtually nothing at any of them apart from rubbish. In fact on one such I came back with several dozen mastitis treatment tubes and bugger all else. Yesterday however I attended the NCMD charity rally in support of The Shakespeare Hospice at Stratford upon Avon. My finds for the day were precisely two buttons and the usual scrap. There were around 200 detectorists on some 150 acres of arable land spread over 4 fields. The land had been roughly disked and roughly tilled, both superficially, with large clods of dried clay liberally spread across the surface of at least 2 of the fields. This made it very difficult to get a good rhythm of low swings and there were a few examples of people more or less waving their detectors about like Simon Rattle conducting the Berlin Phil. 6″ down was more or less solid, sticky clay of the sort to excite artisan potters. The surface had been baked and the dry shards of clay were like rough gravel when you put your hand on them. The field between the parking area and the registration tent was fairly rough and uneven, but the far field was reported to be much worse; indeed one chap told me it was “bad enough to break your ankles”. It was, overall, bloody hard work. One field was fairly smooth but both fields I tried were contaminated by broken bricks, pieces of glass (including much weathered, old glass with large bubbles in it), tiles and other roofing materials, pieces of cement or mortar and by small, shapeless pieces of metal which were very light and therefore probably melted alumimium of some sort. There was a lot of dissatisfaction with the state of the land, including several comments that it would have been better left as stubble. A couple of people mentioned a lot of problems with falsing but that may have been down to their particular detectors. As with all large rallies people had come from all over the place to attend including Sheffield, Brighton, Northants and London, thus incurring significant travelling costs. The first person left at 11.30am; he was an elderly chap with arthritis who had come from near Heathrow but couldn’t cope with the uneven ground. There were more departures over lunchtime, including a group of 3 who went off to finish the day at one of their local permissions, and a few more by the time I left at around 2.30pm, but most people seemed determined to give it “just another half hour” and to “get their money’s worth” as one chap put it. It’s surprising what people will complain about. I overheard one chap saying it was a poor do that the NCMD had not arranged for a trade stand or a burger bar to be there, and that next year he would be joining the FID instead. Since most mobile burger vans seem to be of the greasy-donkey-burger-for-50p variety that didn’t seem much of a loss. The same chap bemoaned the lack of “fun” aspects to the rally, specifying that there was no token hunt (in which the organisers bury tokens for people to dig up and win prizes for doing so). By the time I left I’d heard reliable reports of 5 hammered coins, a gothic florin, an unspecified number of Roman grots and a half sovereign. 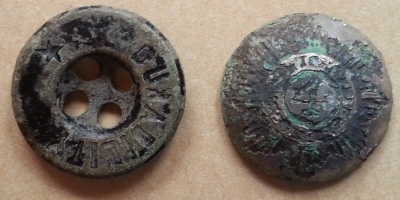 After the rally additional finds reported on one of the forums included a “nice small Saxon cruciform brooch apparently with loads of enamelling intact”, a lead bale seal, a 16th century harness bell and a silver item which may have been a mount or strap end (date unknown). The FLO was in attendance but whether she had enough to keep her busy I have no idea.